Designed for large venues, the PowerLite 5520W widescreen installation projector delivers uncompromising image quality and professional-grade reliability. 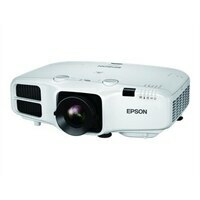 Offering high color brightness, this projector ensures bright and vivid images. Featuring 5,500 lumens of color brightness and 5,500 lumens of white brightness plus WXGA resolution with up to 15,000:1 contrast ratio, the PowerLite 5520W shines even in environments with high ambient light. Horizontal and vertical lens shift increases installation flexibility, while advanced digital connectivity, including HDBaseT, ensures easy integration. Miracast allows presenters to wirelessly mirror Android device screens. The projector also supports enterprise-level wireless security and remote network monitoring/control.